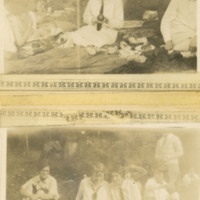 Two photographs taped to an index card. The top photograph is of a student holding an apple and having a picnic, and the bottom photograph is of two students sitting side by side. Gift of Helen Herman, March 1986.